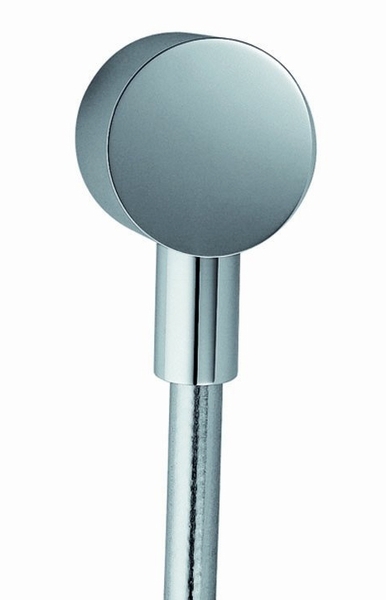 Add a splash of class and elegance to your new shower with the Axor Wall Outlet from Hansgrohe. As a leading manufacturer of all things plumbing, Hansgrohe never skimps on quality when engineered their many plumbing products. The Axor Wall Outlet is not only an amazing value, it is easily installed to add a hand shower and a hose to any existing shower. The Axor Wall Outlet features a 1/2 inch Female NPT inlet, and it also fits all 1/2 inch hoses for added versatility. With a durable chrome finish, the Axor Wall Outlet has been built to last for decades from durable, long lasting materials. WARNING: This product can expose you to one or more chemicals, including lead, which are known to the State of California to cause cancer and birth defects or other reproductive harm. For more information go to www.P65Warnings.ca.gov.